Pt. 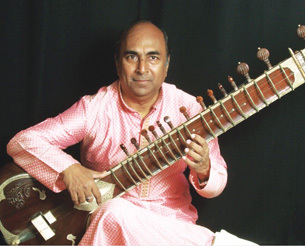 Shashank Katti born in a family of musicians is a reputed, well-known Sitar player of Mumbai. His late grandfather was a 'Kirtankar' and mother, Mrs. Vimal Katti was a classical singer of her time. Naturally, music has been flowing in his blood from his birth. Besides being a professional musician he is also an electrical engineer. He started learning vocal classical music under his mother for 10 years and continued it under the able guidance of Pt. Y B Joshi for one year. Then he turned to Sitar when he was 16 years old. He started his initial lessons in Sitar from Pt. Baburao Kulkarni. After that Pt. Kamlakar Bhatawdekar - a renowned flutist and also disciple of Sitar maestro Ustad Vilayat Khan Saheb, taught young Shashank the most important 'Gaykee Ang' and turned him into a fine artist. He was awarded 'Sumani' by 'Sursinger Sansad'. He is an 'A' grade national artist of A.I.R. and is well recognised by music lovers all over by his regular performances on A.I.R. and Doordarshan. He is ‘Sangeet Visharad’ of Akhil Bharateeya Gandharva Mahamandal. He is an approved composer of A.I.R. and Doordarshan. He has worked with many recording companies like Venus Records, HMV, T-Series, Times Music etc. He was appointed as an expert in documentary film 'Gandharvaveda’ based on Music Therapy and produced by Films Division. He has been found unfolding the traditional Hindustani Ragas in the most authentic form in 'Gaykee Ang' with subtlety and originality in all his recent concerts. His concerts are, no wonder, applauded by both, press and connoisseurs. For over a decade he has been working on 'Music Therapy on different ailments' with a team of doctors - Dr. Himalaya Pantvaidya (M.D. ), Dr. Vaidya Sanjey Chhajed (M.D. - Ayurveda) & Dr. Shubhangee Dhage to develop a new therapy system called 'Sur-Sanjeevan'. It has been observed that Sur-Sanjeevan works on diseases like Arthritis, Hypertension, Diabetes, Asthma, Insomnia, Migraine etc. Pt. Shashank Katti has developed 8 CDs under the title Sur-Sanjeevan for these ailments. He has also developed series of 8 CDs for pregnant women called as 'Garbhankur', marketed by Times Music. He is also a music composer and is working with his brother for Venus Records. The Duo is composing music with nick name ‘Shank - Neel’ which is a very popular name in the music industry.